Magic Tree House (Grade Level 1-3) – A brother and a sister named Jack and Annie found a magic treehouse. When every book starts they go to the treehouse and they wish to go somewhere. Then the treehouse starts spinning and spinning and then when they get wherever they are going the spinning stops. Sometimes they go to Egypt, a castle, the Amazon, dinosaur times, or Hawaii. While they are there they learn new things. Ivy + Bean (Grade Level 2-3) – These are stories about two girls who go on adventures. Bean is funny and sometimes doesn’t pay attention. Ivy is smart and quiet. They are best friends. Nancy Clancy (Grade Level 3) – Nancy Clancy is Fancy Nancy but she grew up. She is a detective with her best friend Bree. I like these books because they have fancy words. Flat Stanley (Grade Level 3) – Stanley got flat when a big board fell on him. Then he was flat and could go under doors. He could also get in an envelope and then he could go on fun adventures. Roscoe Riley Rules (Grade Level 3) – This boy Roscoe doesn’t mean to break the rules, but he forgets. Humphrey books (Grade Level 3-4) – It’s about a classroom hamster in Room 26 at Longfellow School. Humphrey stays in his cage during the day but when nobody is there he has some freedom. When he gets out he solves classroom problems and sometimes he goes on missions. 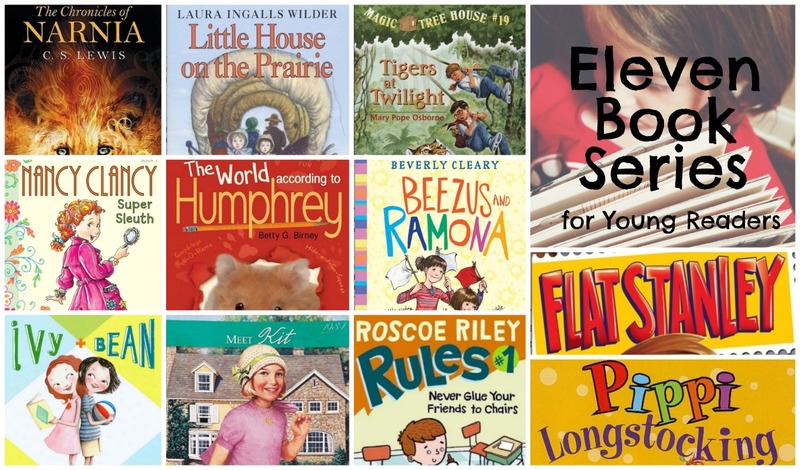 Ramona books (Grade Level 3-5) – These books are about a girl named Ramona. She has a sister named Beezus. Ramona is wild and gets in trouble a lot. Little House books (Grade Level 3-5) – I love reading about Mary and Laura living in different places a long time ago. They lived in the woods, on the prairie, and a dugout. Pippi Longstocking (Grade Level 4-5) – Silly Pippi lives by herself. She has a monkey and a horse. She tells stories that I don’t know if they are true or not true but they are funny! American Girl historical fiction books (Grade Level 4-5) – There are a lot of American Girl doll books. Every American Girl doll has some books about her and the books tell all about how she lived. Narnia books (Grade Level 5-6) – All about 4 brothers and sisters who discovered a magic world called Narnia. There was a witch who turned things to stone. There was a lion. A lot of stuff happened there that couldn’t happen for real like animals talking. We’re looking for some new series to start as well! We have a few on hand already: The 39 Clues, Boxcar Children, Nancy Drew, Encyclopedia Brown, Series of Unfortunate Events, How to Train Your Dragon, Anne of Green Gables. What other book series do your tiny humans love? Like this post? Click the little “Pin It” button below to add it to one of your Pinterest board! My daughter loves most of those! I’m going to have to bookmark this so we can check out the rest of them. Fancy Nancy is a detective?!?!? How did I not know this??? This totally made my day! The 39 Clues books are great….of course there’s the Harry Potter series and then the Percy Jackson series. Rick Riordan has been great for Payton and I think this year Owen will probably get into his books. Do you know of a place I can go to label my books by AR Reading Level? I have a TON of children’s books from beginning readers all the way up to past Payton and I’d like a source for labelling them. Peyton has all the Spiderwick chronicles books. He loved them! he also read the 39 clues books, one that he has also has links to watch videos on the computer as you get through each chapter. It was really interesting. I have the entire collection of the series of unfortunate events, and loved them as well. If there is a big word the author thought you might not get, he told you what it meant and I thought that was kinda cool. I’m a sucker for the Harry Potter Series. I think I have read it about 4 times by now. There is also the Percy Jackson Series that we like. The movie is cute as well. The Hunger Games Series is still a little old for them, but not too far off. You might like it. Peyton read it after I did. He still has to finish the 3rd book. I will be keeping this list for Wyatt, who is just now really starting to enjoy reading. My son is in love with The Boxcar Children right now! It started off with reading the first one as part of our homeschool curriculum and now he’s on book 10. This is what started his love of reading a good book series and now, everytime we read a new book he likes, he asks if there is another one. He also likes the Little House and Ramona books. We just finished The Adventures of Doctor Dolittle and found out it is part of a series, too. (He says this is one of his favorite books so far.) One more series he likes is the Imagination Station books. They are similar to Magic Tree House books, but are faith based travels through history.